This is what I am calling a rescued Grandmother’s Flower Garden. 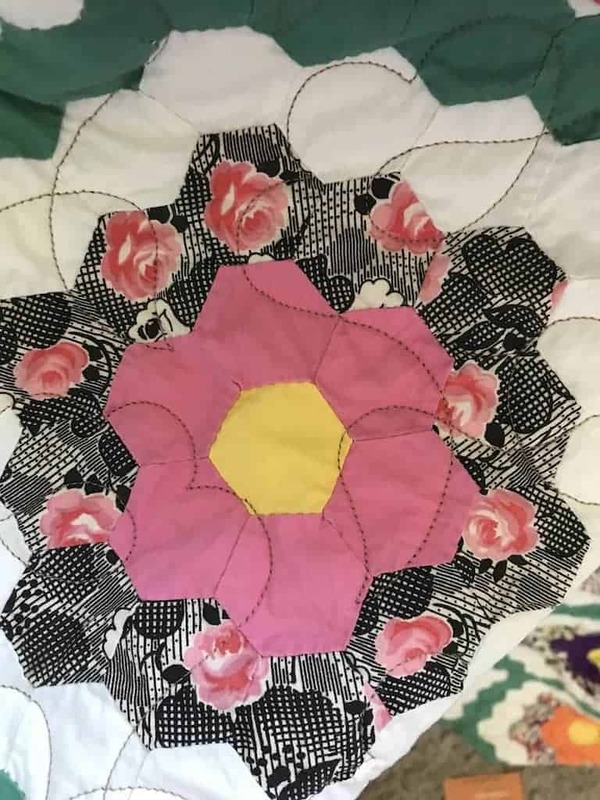 A friend found it with a bag of quilts. We went through the bag, she kept what she wanted. This top was there, but unquilted. 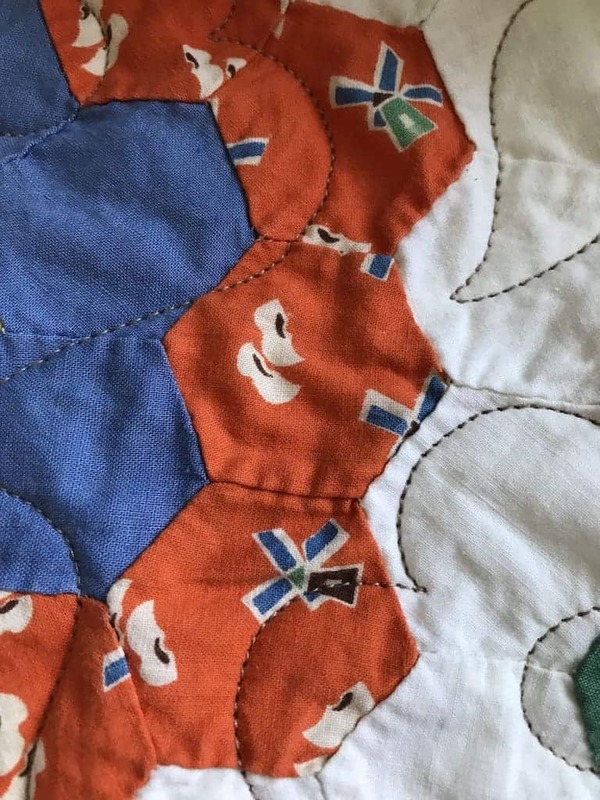 It had lots of teeny-tine hand stitches holding it together – done as seams rather than English Paper Piecing. She didn’t want it. So I hatched a plan. It had been hanging around for awhile so it became part of my One Monthly Goal for May and one of my second quarter goals. It is done! HOORAY. 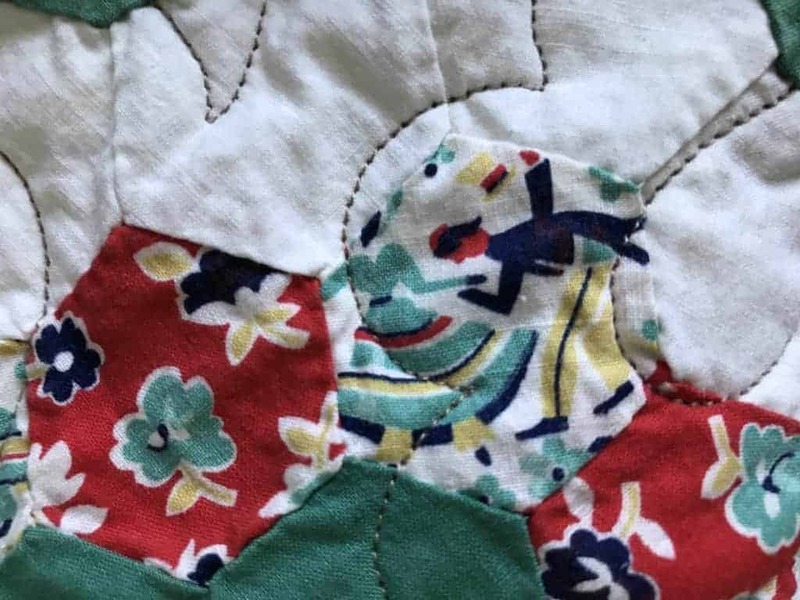 Many people say only do what the original quilter and time would have done – even attempting to find period fabric. Well, that wasn’t in cards. WHY? The quilt top was in good condition. It wasn’t important to any one and just wants to be used. It is not historically significant, but the colors are brilliant as I think it has not really seen the light of day. My decision -have it machine quilted, bind it and donate it. 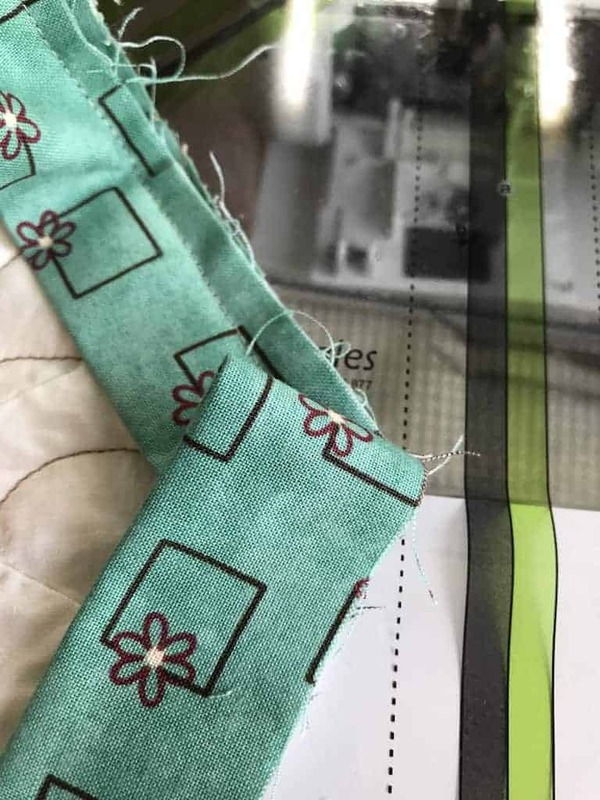 I selected a fabric for the back that was the Massachusetts state flower – the Mayflower – made by In the Beginning Fabrics. 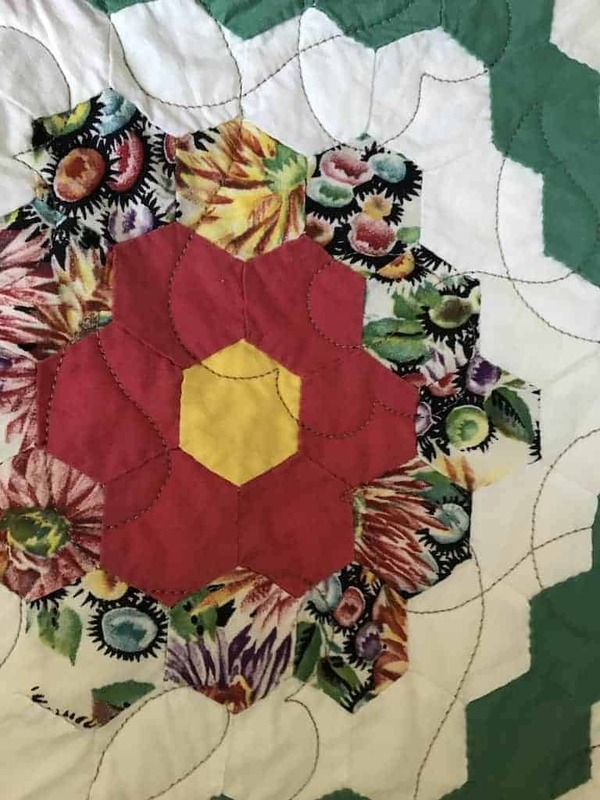 It went well enough with the quilt, and I thought honored the hexagon pattern. 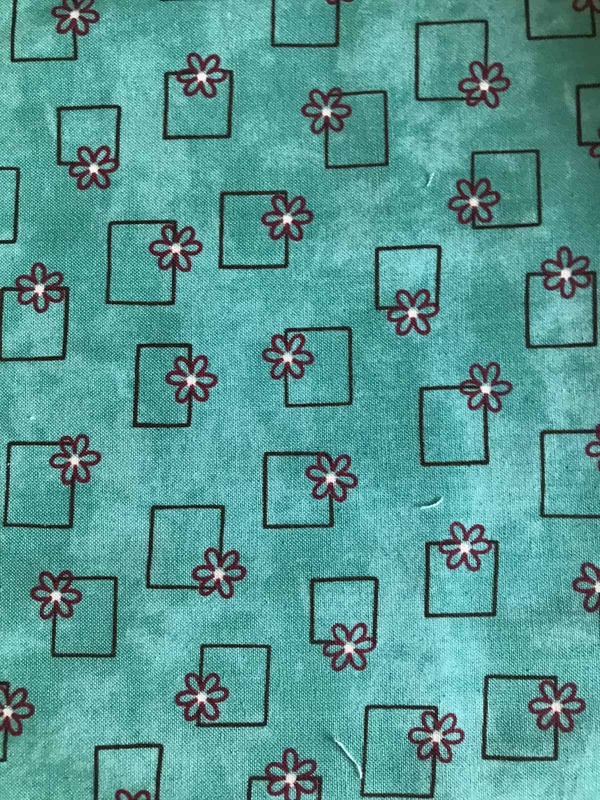 Finding a binding was harder, but this print from Henry Glass Fabrics had just the right green and flowers. So, while more modern it went well enough with the front and the back to work. The hardest part was deciding how to bind it. I figured when it cam back from the quilter I would just do it. And I did. I trimmed all the edges straight. This preserved the quilter’s intention, but also insured that it got finished. 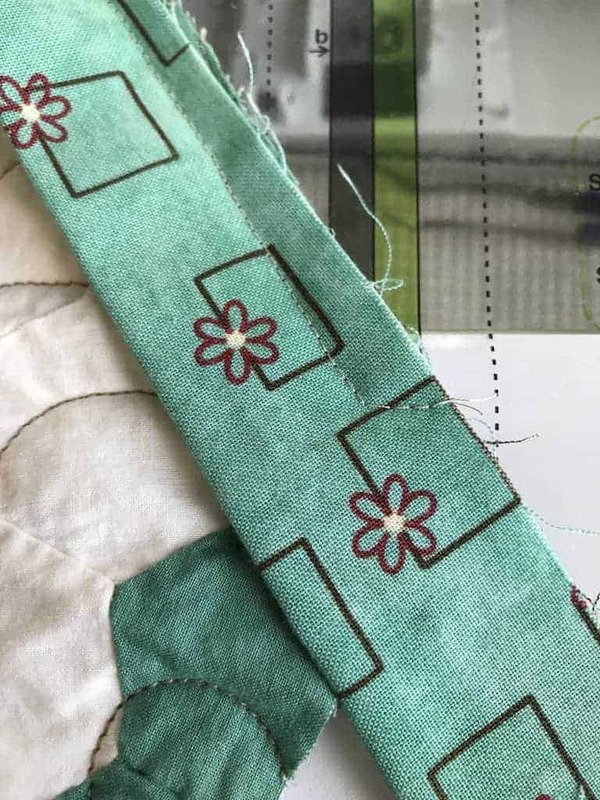 The binding was an adventure – not too bad – but a lot of turning! Here are the pointy edges. 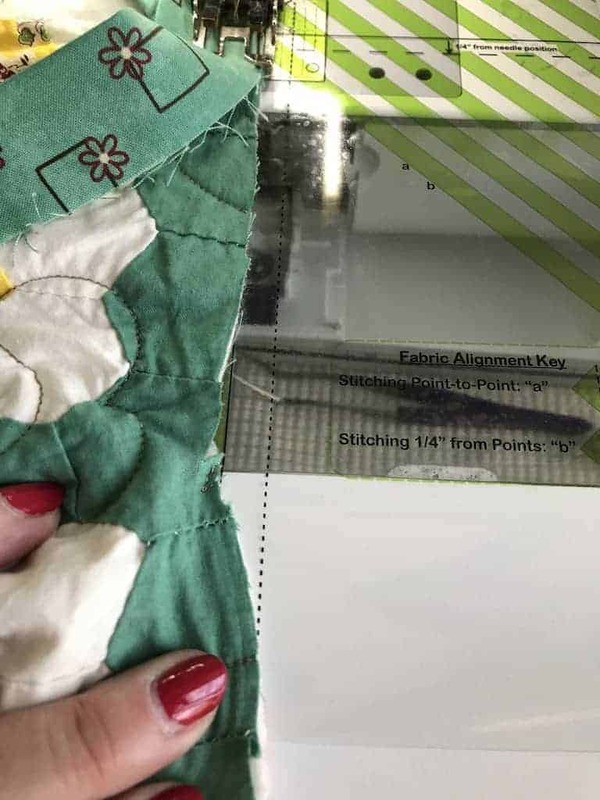 Fold and you are ready to sew done the next edge. Here are the valleys. My approach was to trim close to the seam line and kind of stretch. The binding became a bit curved. Someone will love this quilt. It needs to be washed and dried, which is for another day. It will either go as a raffle for the church (where I met my friend who gave me this quilt) or as a donation to a woman’s shelter or someone getting a new home (refugee or homeless). 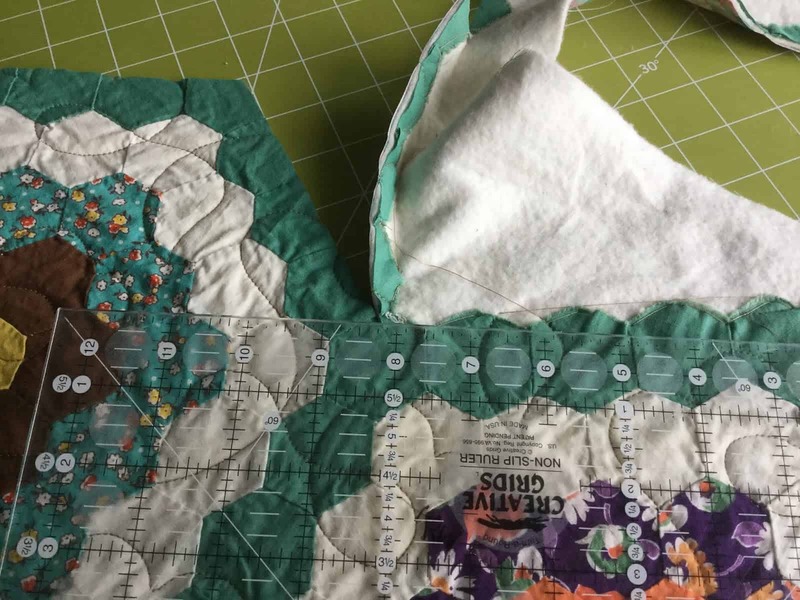 I think the quilter made it to be used – and so it will be. It does fit a queen size bed!! I am commenting in the hope that I will get your comments. Wow, so big! It turned out just beautiful, Kathleen! Excellent solution for the binding. Great job figuring out how to get it finished and ready for gifting and loving. I could just hug Percy! Percy is sweet, isn't he. 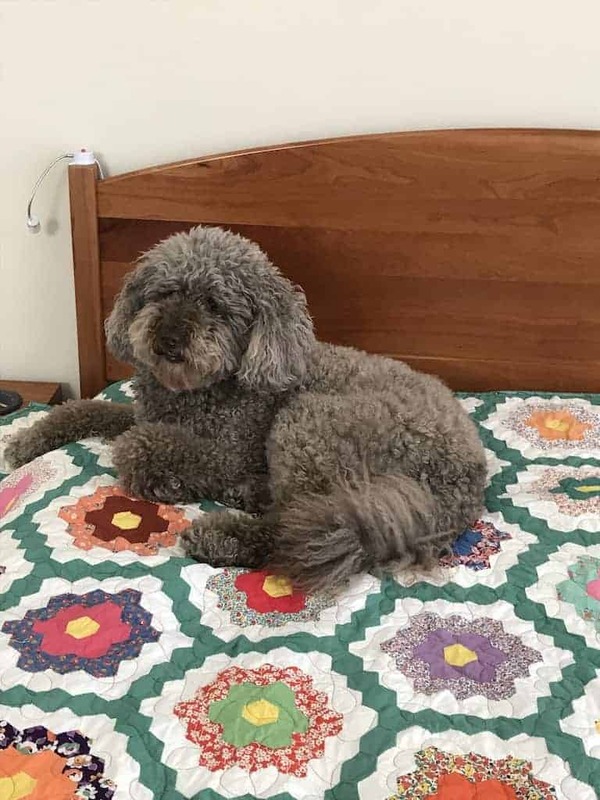 It is a really big quilt – I guess another reason to get it in use! 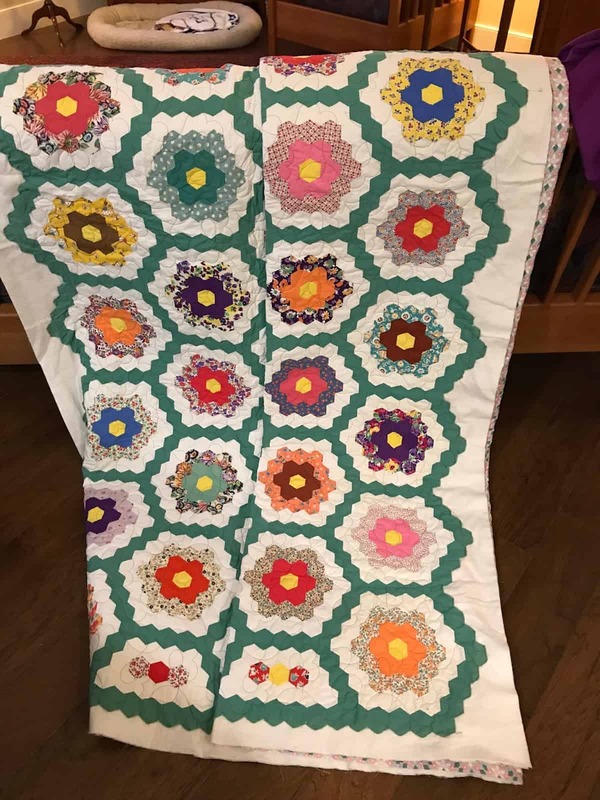 We hardly get queen-size quilts to donate, so this is a treasure! It is a beautiful finish! I would have rescued it also. It really felt good to do it. Thanks for stopping by! I think it is fabulous and will be a quilt that someone is going to be thrilled to have! Thanks, Yvonne. I am sure it will be well loved and it felt good to make it usable. Beautiful! I think the quilter would have approved! It was a great project and one that I am glad is done – I have had it for a few years. 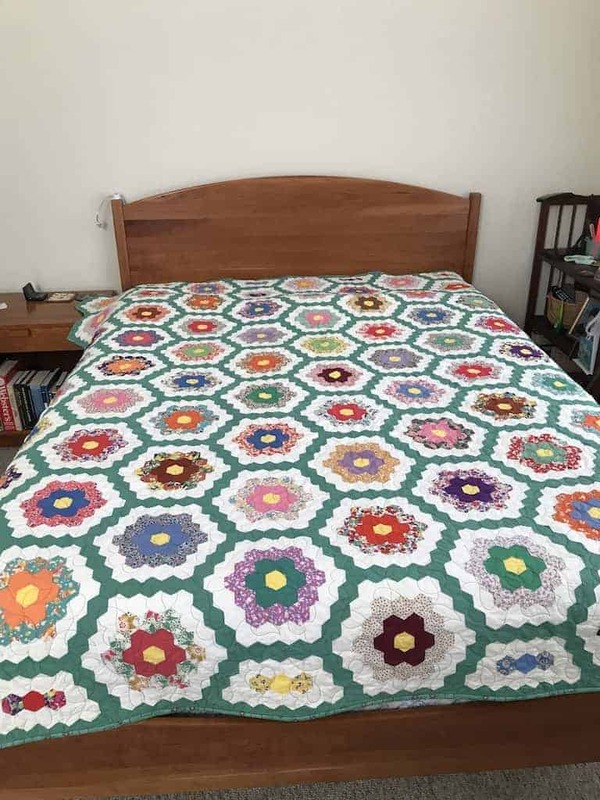 It's lovely, and I'm sure the original quilt maker would be thrilled it is finished. The shade of green in between the flowers is especially stunning. This will keep someone warm with love. Thank you. That green is so hard to match. 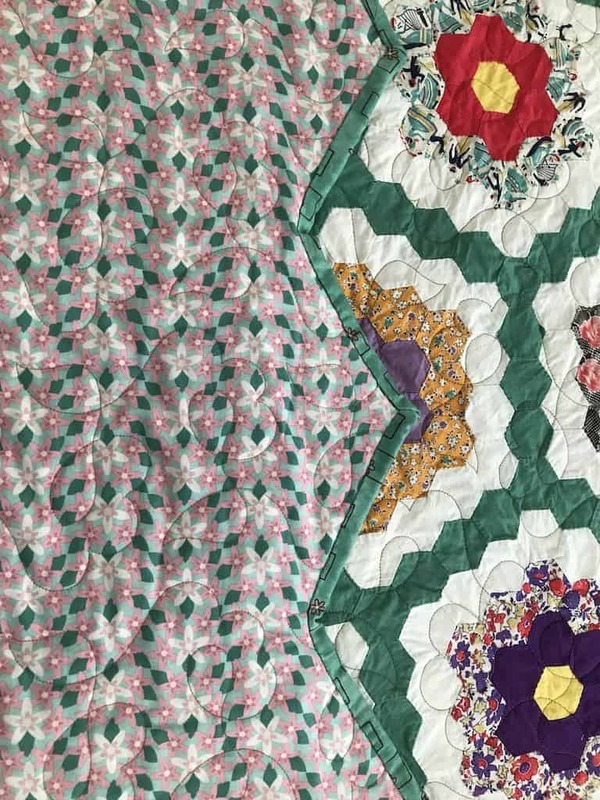 I tried for nearly a year on another quilt – but that had more emotional value for the owner, my sister-in-law. Great rescue! I agree that getting it finished is more important than trying to match fabrics to the period. This looks great and will be perfect for keeping someone warm 🙂 Thanks for linking with TGIFF! Thanks, Leanne. I do think it will be perfect for its new owner. Well, you've made me rethink a top I was recently given… and you've made me wish I HAD kept the blocks my aunt gave me that she and her mother had started… Great finish, just great, and hell ya on the use it rather than worry and fuss (as uh I did and am doing) and then the top or blocks languishes in a bag. Love that binding fabric!! Thanks, Sandra. It was a great labor of love. I have done one or two others for my sister-in-law, and those were treated differently, more true to the value of them. I do like a challenge and once I got past how to bind without chopping the whole thing down, it was worth it! Oddly, the binding color blends nicely with the green. 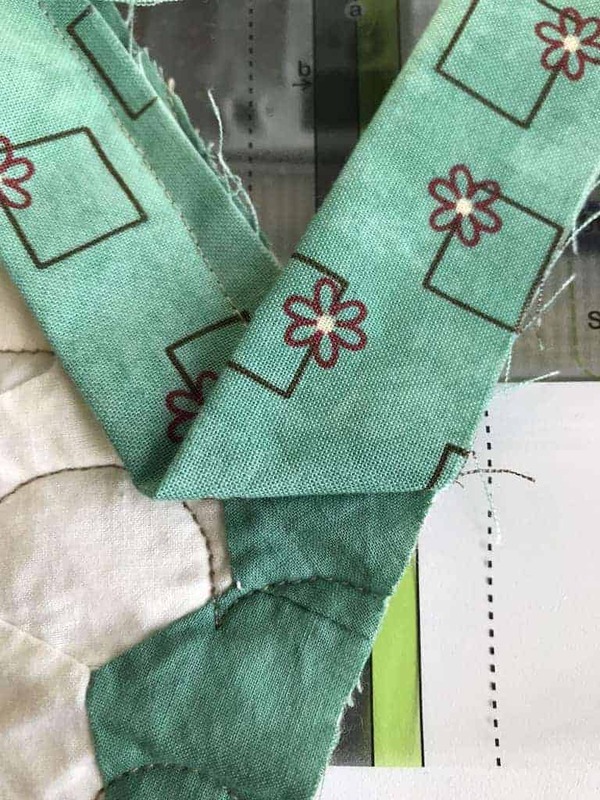 I spent a year finding the right green for my sister’s in law quilt, and wasn’t going to get into that bind! Thank you Louise, for your comment and thoughtfulness around the Blogger problem. I so agree that used is better than lanquishing in a closet. Fabulous rescue quilt! I am working on a Grandmother's Flower Garden and very much appreciated that you shared your finishing process! Thank you! You are welcome. If it was mine I might do it a bit differently- but this was the best way I thought to finish! Beautiful! The top is beautiful and you finished it into a perfect quilt. Someone very lucky will receive it. Thank you, Cheryl, it was a great feeling to have this finished. Break all the rules, is what I say! If someone will use this/any quilt, it doesn't matter what 'they' say. You've given it a wonderful chance at a new life. I totally agree. I was very strict how things should be made at one point! Now, I base my decisions more on the purpose to f the thing, then the techniques follow. Kathleen, what a great rescue story this was. I think you made good decisions about a forgotten project that did not have sentimental value to you. I wonder what will happen to my unfinished quilts. Who will love them? The truth is that no one really will as much as I do.